The rocket probe New Horizons sent back more pictures from the Pluto system. On Friday (17 July 2015) NASA released some of them. Among them: a frozen lake of carbon monoxide. 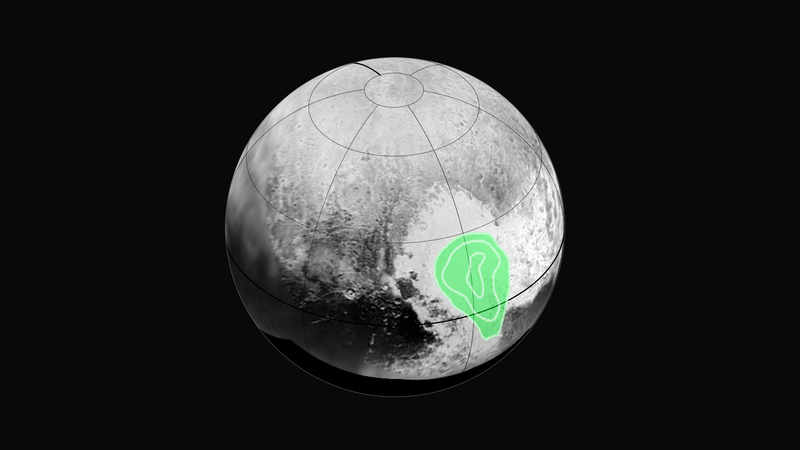 This lake covers most of the western lobe of Tombaugh Regio (the “heart” on Pluto). In the days that have followed, neither NASA, nor the Johns Hopkins Applied Physics Laboratory, nor the Southwest Research Institute has tried to explain the carbon monoxide finding. They published a terse caption for the false-color image of the carbon monoxide lake. That caption has a link to another image showing closeups of the floor of Tombaugh Regio. No one seems to want to answer the question: where did all that carbon monoxide come from? False-color image of Pluto’s heart-shaped plain (Tombaugh Regio). The western lobe of the “heart” holds a lake of frozen carbon monoxide. Contour lines show increasing concentration toward the center, suggesting a lake of increasing depth. Photo: NASA/JHUAPL/SwRI. Carbon monoxide forms from the partial burning of wood or coal. With enough oxygen available, wood will burn and release carbon dioxide. But wood burning with a low supply of oxygen will release carbon monoxide instead. According to Wikipedia, Aristotle first wrote that burning coal releases toxic fumes. In fact, an ancient bath, with smoldering coals and all the doors closed, served as the first “gas chamber.” Today, suicide by carbon monoxide poisoning works best by simply starting a car in a closed garage. The engine will release even more of the gas in the closed space than in an open space. In the wild (that is, apart from “civilization” or even any camp), sunlight acts on certain trace gases to make carbon monoxide. Aside from that, volcanoes release it as a trace gas. And in any forest fire, as the fire depletes the oxygen around it, it releases more carbon monoxide and less carbon dioxide. So how did carbon monoxide form on Pluto? Walter T. Brown of the Center for Scientific Creation gave an answer today. According to the Hydroplate Theory, all trans-Neptunian objects, like all asteroids, comets, and meteoroids, formed from water, rock and mud from earth. A breakout of a subcrustal ocean about fifty miles below ground threw out vast amounts of this material – perhaps as much as four percent of the mass of the earth. The mud and rock included uprooted trees and shrubs from the forests of the early earth. Pluto and its largest moon Charon formed when a swarm of water, rock and mud accreted to form these two objects. All such accretions released kinetic energy as heat. The heat on Pluto (and on Charon) eventually caused “slushy geysers” to erupt to the surface. Some of these geysers produced the 3500-meter (11,000-foot) mountains at Pluto’s equator. But the heat, says Brown, also burned the uprooted trees, shrubs, and other vegetable matter that accreted with the other matter (water, rock and mud) to form Pluto. And of course, that burning needed oxygen. Oxygen came from one or both of two sources. Either it escaped from earth with the solids and liquids, or formed when water vapor dissociated in the sunlight of the inner solar system. But burning in a confined space yielded carbon monoxide, not carbon dioxide. When that gas broke out onto the surface (on Tombaugh Regio), it condensed, then fell as rain into a basin in the heart shape. Then it froze. The published photo shows contours of ever-increasing amounts of carbon monoxide as one approaches the center of the lake. One would expect precisely that when looking down on a lake; the contours in fact show its depth. As of the time of posting, the New Horizons control and investigation teams have not tried to explain the carbon monoxide. They merely describe it. How they will try to explain it, the world must wait and see. Reprinted from examiner.com and from Conservative News and Views. This entry was posted in Space and tagged astronomy, chemistry, creation, evidence, Global Flood, physics, scientific theory by Terry Hurlbut. Bookmark the permalink. Paul Brundage liked this on Facebook. Johnny Helbo liked this on Facebook. Terry Hurlbut liked this on Facebook. Ted Foster liked this on Facebook. Matt Clark liked this on Facebook.